By FITZ from Arlington Hts., IL. Customers buy these products with the Prevail® Adult Disposable Washcloth Wipes - Soft Pack Press-N-Pull Lid - 12" x 8"
Comfort Personal Cleansing® Rinse Free Bath eliminates any risk of transferring bacteria from a dirty basin. Premoistened, disposable washcloths facilitate bathing each body area separately, which minimizes cross-contamination. No splashing or spilling. And no more dumping contaminated water into sinks. 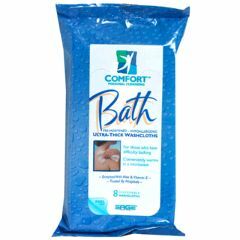 Furthermore, Comfort Bath™ is rinse free and can cut bathing time in half! This is especially important in times of nursing shortages and increasing dependency on agency nurses. Everything needed comes in one convenient package. Simply warm in a microwave or warmer for soothing comfort. Each case includes 44 individual packs with 8 washcloths in each pack. In a recent hospital study, 96% of patients preferred Comfort Bath™ over the basin bath. After using Comfort Bath™, 100% of the patients felt clean, 96% said their skin felt soft and 97% said that it was warm, comfortable and easy to use. In another study, Comfort Bath™ was preferred over the basin bath by an amazing 100% of nurses! In fact, all nurses stated that Comfort Bath saved time, was easy to administer and left their patients clean and satisfied. AHRQ Guidelines for Skin Cleansing state, “Avoid hot water, and use a mild cleansing agent that minimizes irritation and dryness of the skin.…Care should be utilized to minimize the force and friction applied to the skin. Comfort Bath’s ultra-soft washcloths are less traumatic to fragile skin than rough, laundered washcloths. They’re also soap-free. Compared to most deodorant soaps, Comfort Bath™ has a pH closest to normal, healthy skin. This unique, skin-friendly formula is dermatologist tested and proven gentle. It thoroughly cleanses and nourishes skin with aloe and vitamin E, leaving patients’ skin feeling clean, moisturized and soft. With a rinse free Comfort Bath™, there’s no waiting for warm tap water. In fact, it requires no tap water at all, not even for laundry. Comfort Bath™ can have an extremely positive impact on a facility’s water consumption-without compromising patient comfort or nursing convenience. Comfort Bath™ even replaces laundered washcloths and minimizes the use of laundered towels, which helps cut expensive laundry costs and linen replacement. These are great for bed baths. As a caregiver I use these to bathe my dad on days in between showers. You can heat them up in the microwave, which he appreciates. They are easy to use. I have found these to be very sturdy. They seem to be the best ones out there. Open the easy peal away entry tab. Put in microwave for a few seconds. Carefully remove one lightweight, but very sturdy warm cloth. The visual instructions show you where to start washing. The sensual warmth of this cloth is very relaxing when you can't shower due to fear of falling, disability, lack of bathing facilities. Great for traveling, kids. Prefer the calming lavender over the plain. Biggest concern is the hot, steamy, thickly fiber bonded cloth may burn your skin if you do not follow directions on how many seconds to put in microwave. Remove cloth carefully. I always put it on less microwave seconds. The cloth is a very good sized washcloth. Sturdy. Functional. Lightweight. Easy to use. Budget Shopper. Midrange Shopper. efficient. Easy to use to clean my body anytime. I use them weekly in my private areas. These would be great for International travel or hiking. I use them for cleaning up on the days that I am not able to shower. I care for my husband 24/7 and he cannot be left alone long enough for me to shower. It is not often that I am able to get someone to sit with him so that I can get a shower. This product is a thick disposable washcloth that makes one feel clean wherever it is used. I keep a shelf in my linen closet full of these. When u say a pack of 8, I guess you mean only 8 in a pack? Yes, there only eight disposable very thick cloths in each package. These were originally made to replace washcloths in giving a bed bath. On the package, there instructions of where to use each cloth on a patients body in order to keep a clean and wet cloth to use on the correct part of the body. What are the dimensions ex: 13x13. Or 14x14? I purchased a box and we were very pleased with softness and skin protection. The ones in my package are 8.5 X 8.5 inches. Nice and thick.